There's always someone waving around the latest realistic fiction book, raving about how marvelous it was. So many of these stories involve significant losses - especially the deaths of children or parents. "It touched my heart!" she swoons. "I needed a full box of tissues," he tweets. I feel like the odd man out, struggling to really immerse myself in these stories of pain and loss. While there are some notable exceptions (Bridge to Terabithia springs to mind), this is generally a fixed part of my reading life. Everyone says, "ahhhhhh". My brain says, "meh". It's not the actual loss or deaths that push me away. I'm right on board with Snape's undying love for Lily, and I wept when he died. Every death in the Potterverse wrenched my heart, and I still found myself coming back time and again to visit Hogwarts. So what is it that prevents me from fully enjoying these books the way everyone else seems to? 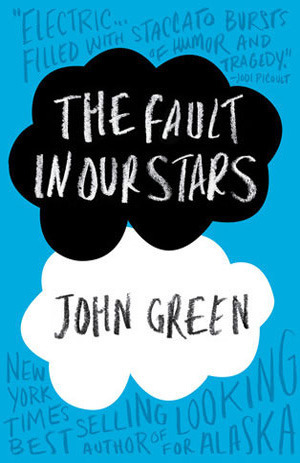 I think I finally figured it out while reading The Fault in Our Stars by John Green. It is a wonderful book. Beautifully written, with vivid characters that spring to life on the page. Yet I didn't fall in love with it the way everyone else did. The reason? I separated myself from the characters on the page while reading. For the first time, I could actually feel it happening. I'm a mom. I'm a huge worrier. I have a touch of claustrophobia, acrophobia, and a dash of several other phobias. Nothing life-changing. Nothing that would require me to vastly alter my lifestyle. Enough, though, to always have me slightly anxious. I've always been a nervous Nelly, but motherhood intensified each and every anxiety in my life. Books like The Fault in Our Stars pull at my heart in a way that makes me realize my children are at risk. They could be the next small cancer patient. They could ... seriously, even starting to type the list that is in my head is giving me the shakes. I "let go" while reading See You at Harry's by Jo Knowles (and adored the book) because I was particularly vulnerable when I picked up that book. It was right after the Sandy Hook incident, and I guess I couldn't build my wall. I woke up in panicked sweat so many nights after that reading. I just can't let go enough while reading books like that to completely submerge in the story. Fantasy? Science fiction? I can read similar story-lines in those books without having an anxiety attack. Some are far in the future, so I know the problems within can't impact my sons. Some are in alternate worlds with magical powers and mythical creatures. I can allow myself to become those characters - and their mothers - without laying awake until the wee hours of the night. So the next time you talk about a book that broke your heart, and I pass on the experience, please forgive me. I just can't handle the pain.